In our line of work we receive invitations in the mail on a regular basis. The majority of wedding invitations are as one might expect them to be, elegant in style and to some extent, predictable in format. The invitations that make the biggest impact show creativity, and provide a glimpse into what's to come. You can imagine our excitement when we received a brushed metallic gold square envelope in the mail from our clients Ricki and Mike and upon opening it, found a CD jacket with images of Godzilla in what appeared to be a city on an island -- Waikiki perhaps, or maybe Japan? We were immediately intrigued!
" The Godzilla concept came in a bit of a round about way. 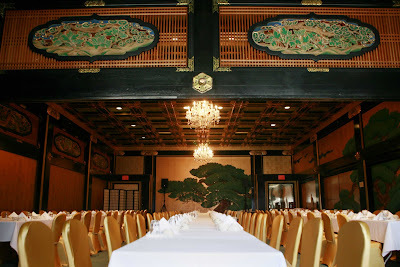 Since the reception room has such a strong Japanese theme (photo attached for reference) we were originally talking about just doing a woodblock style illustration of Waikiki for the image. It was a safe option, but once we got brainstorming about what we thought about when we thought of "Japan" we thought about Godzilla movies. So I talked to an old classmate about doing the illustration and we worked out the details. Since it is a destination wedding for our families we decided to put the CD of local music to try to get them in the right frame of mind for the trip." We're lucky enough to own a hard copy of their invitation and can see all the components. What you can't see is just as special as what is shown above. 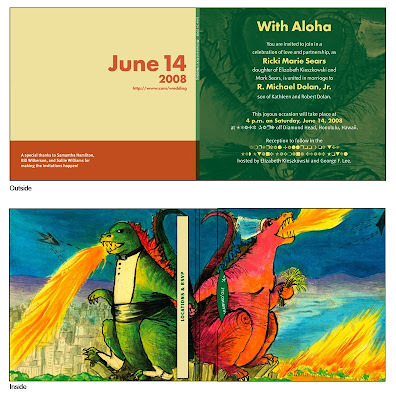 The CD of music included contains mostly Hawaiian songs with artists such as Israel Kamakawiwo'ole, Gabby Pahinui, Mark Keali'i Ho'omalu, and the Hawaii-based Jack Johnson, among others. The back of the CD looks like one of the many indie music CD's we own. And for their wedding cake, Godzilla won't be making an appearance, nor are we going the Japanese themed route, we're making a sculptural underwater invertebrate themed cake, which we're so excited about! Michael also wishes to thank Sallie Willams and Bill Wilkerson for the printing, and Rick and I like to thank Mike and Ricki for sharing with us their creativity and helping support ours.